February is the season of hearts and with Valentine’s Day now here, love is truly in the air. While you’re preparing for an unforgettable date for your special someone, don’t forget to show your love and affection to the ones who love you unconditionally too – your pets. In this month of celebrating love, the Pet Food Institute’s Well-Fed, Well-Nurtured campaign aims to engage Filipino pet owners in responsible pet ownership through good pet health and proper nutrition. Here are some suggested ways to show love and care for your furry Valentine. Chocolates, cake, champagne and other Valentine treats will surely surround your home. You can enjoy these sweet treats, but your furry companions can’t. In fact, these treats are toxic. Chocolates contain theobromine and other types of candy can contain xylitol. Alcoholic beverages are also dangerous for pets. If ingested, they may lead to loss of coordination, seizures, liver failure and heart problems among others. The scent of flowers may be also appealing to your pets, but they can pose a hazard as well. While not all types of flowers are dangerous, if your furry companions happen to nibble on one that is harmful, it may cause upset stomachs, vomiting and diarrhea. All types of lilies can be fatal to cats and dogs if ingested. Spines and thorns from other flora can also cause serious infections if your pet gets punctured. Candles can surely create a romantic mood but they must be set away from areas where your pet can reach them to avoid any accidents. Make sure to keep all hazardous food, flowers and other holiday items out of paw’s reach. Even if you can’t give chocolates or flowers, there are still other ways you can show your affection to your furry Valentine. 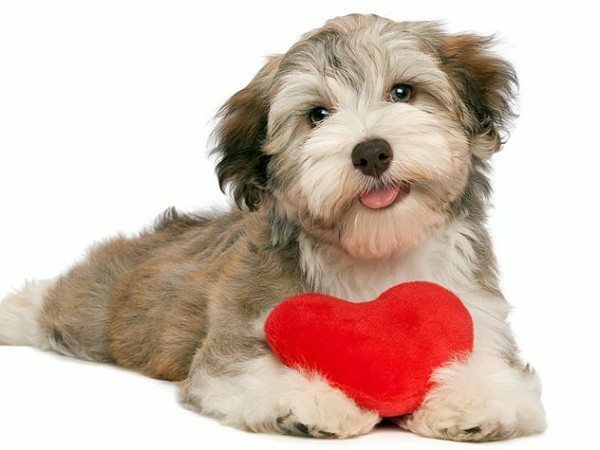 Take them shopping at the pet store and pick a special toy or an outfit as your Valentine present, and treat them to a special meal with excellent quality pet food and treats. Pamper your pets by taking them to a pet salon or spa, and indulge them with a grooming or spa treatment. You can also give them a bubble bath coupled with a loving massage at home. The best present you could give to your pet is good health. Show them how much you care by taking them to see the vet for a routine checkup. This is a good time for your vet to check on your pet’s health. Make sure their vaccines are updated and get their teeth cleaned too. Your pet will surely be ready for your Valentine date and give you lots of furry hugs and sloppy kisses. Take out a few hours of your day and give your pet the undivided attention it deserves. Go on a car ride, take a walk with them on the beach, hike up a trail, go on a trip to the park, or take a scenic walk to see something new and exciting. Embarking on an adventure together will surely bring you even closer to your pet, and it will definitely appreciate the love and time you are giving. To keep your pet entertained and fit, set aside some time to play. Grab a favorite toy and play a favorite game. You can also get creative by making homemade toys with love. If your furry Valentine has pet friends, arrange a play date for them. Bring some treats along too and don’t forget to give your pets a fresh bowl of clean water to avoid dehydration. However, don’t forget to provide treats in moderation. Shower your pet with lots of TLC throughout your date. At the end of the day, invite your furry friend to snuggle up on the sofa, give them belly rubs and cuddles. Talk to them as they enjoy quality time with you, letting them know how much they mean to you. Since Valentine’s Day is a celebration of love, your pets who love you best should be part of the festivities too. With these practices, pet owners and their furry friends will surely have a date to remember. As the voice of the United States pet food industry, PFI and partner organization Veterinary Practitioners Association of the Philippines (VPAP) is committed to promoting and encouraging the Filipino pet owners to provide proper nourishment and care to their pets, striving to make them Well-fed, Well-nourished cats and dogs. Previous Post: « Who is your first love?